A very important determining factor of how many meteors will be visible is your observing conditions. I expect that a great majority of you will be watching from your observing conditions. I expect that a great majority of you will be watching from your backyards where lighting will reduce the number of stars seen. Unfortunately, up to 75% of the meteor activity will be missed under such conditions. A majority of the visible meteors are dimmer than the brightest stars. Many of these meteors will be missed if the sky is not truly dark. Serious meteor observers watch from areas far from city lights in order to see the maximum amount of activity. I am not trying to discourage backyard observing. I only want to warn those who go outside expecting to be highly entertained that meteor watching is often frustrating, especially from the bright skies of one's backyard. One definite advantage of backyard observing is that it's close to home and one feels much safer there than out in the wilderness. I would suggest that te beginning observer get acquainted with the aspects of meteor observing from his or her backyard before attempting rural observing. When you are ready for rural observing try to persuade someone to accompany you for companionship and safety. It would also be advisable to inquire at the local astronomical society to see if they have a safe observing site. Rural observing can be entertaining and rewarding as long as proper precautions are taken. Moonlight is also an important factor. Even from the darkest rural observing sites, moonlight will reduce the number of meteors visible. You will find that the Moon is much less of a hindrance if it is less than one-half illuminated. The easiest way to watch for meteors is to lie back in a comfortable reclining lounge chair. In cool weather you can crawl inside a sleeping bag on top of the lounge chair. You will see the most meteors by facing toward the darkest direction available and looking upwards about two-thirds of the way from the horizon to the zenith (the directly overhead point). The basic information needed for a meteor watch is to note how many meteors you see during each one hour period. Sessions less than one hour in length are of little scientific value. If you are observing during a predicted meteor shower, it is important that you distinguish meteors that belong to the shower from the random ones. Shower meteors travel at the same velocity and may appear in any area of the sky. If their paths are traced backward, they will eventually intersect in one area of the sky, called the radiant. To see the most meteors possible, face the general direction of the radiant. You may also attempt to estimate the meteor's brightness (magnitude). The easiest way to do this is to use a star atlas and memorize five stars in your field of view that are near magnitudes +1.0, +2.0, +3.0, +4.0, and +5.0. Then you can use a direct comparison to determine the brightness of each meteor. Most visible meteors are of magnitudes +2 and +3. It is interesting to note the average magnitudes of shower meteors and compare your results with other observers. You may also wish to record each meteor's color, speed (fast, medium, or slow), and any persistent train that appears after the meteor has vanished (common during the Perseid shower). The most important aspects of meteor watching are that it is scientifically useful and it is also fun. You can enjoy it alone or with as many people as you wish. You can keep it simple or bring your camera and video gear. You do not need instruments in order to obtain meaningful results. I find it truly relaxing after a hectic day to just sit out under the stars listening to the wind rustle through the trees and watching nature's silent fireworks put on a late-night show just for me. I think you will enjoy it too. 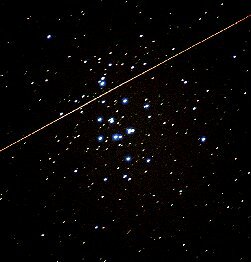 A meteor streaks across Messier 44 (M-44) in this telescopic view of the cluster also known as the Praesepe or the Beehive.